I don't think my last post really hinted at just how awful Wednesday really was. I found two more pictures on my phone that should be documented. This first one is a sticky food handprint on my bedroom door. Notice the large clean area in the center. That is where a lazy pup half assed a cleanup attempt. Not Napoleon's finest work. Although, to give him some credit, he did a fine job cleaning up the actual hand that made the print. My kids are terrible nappers. For an entire year I had to drive Z around to get him to sleep, & by the age of two, he had given them up completely. So, I worked really hard with A to make sure things were better with her. Well, by eleven months, she was already refusing her second nap. So, that *almost* hour long nap in the afternoon is critical for us. So, to set the scene for Wednesday afternoon. A fell asleep on our way home from school. *THIS IS NOT A GOOD THING! * My kids don't transfer well. Meaning, they wake up if you touch them, let alone try to move them. They'll let you pick them up, but there's no way they'll let you put them back down. And, if you attempt to, & they wake up (which nine times out of ten they will), there is NO way they will fall back asleep for a nap. So, I get Z in the house, & turn on the music in A's room. Only to find a massive pile of dog poop on the floor. Her room REAKS. I quickly pick it up, drop it in the toilet (forgot to flush it), spray some fabreze, & run out to get A. Amazingly enough, she let me put her in her crib. Sounds great right? But, I forgot to flush the poop, & she's already ten minutes into her nap. 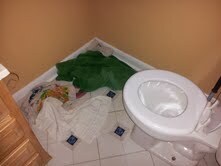 I headed in there right after I laid her down, & flushed. I turned to wash my hands, when I noticed the toilet starting to clog. CRAP. Then, I realize; it's not just clogged. IT'S OVERFLOWING. My bathroom floor was flooding with dog poop water. Seriously. And, I'm standing there in shock, with wet hands & a plunger on the other side of the toilet thinking, "WHERE IS T?!" I scramble to stop the clog, & ran for the towels. Got the whole thing cleaned up, & walked out to check on Z just in time for A to wake up. Thank you, Napoleon, for making my day just that much better.